Calling all you dog and cat owners! 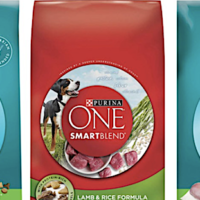 Go request a FREE Bag of Purina One Dry Dog or Cat Food – $9.99 value! Simply go here, and take the Purina One 28-Day Challenge, select your coupon and fill out the short form to score this freebie. Note that a “Thank You” in red will appear at the top of the page confirming your request. Allow 2 to 4 weeks for delivery! Took many, many, many tries to finally complete form. Kept saying error in last name format then first name format. I wish I could get another coupon for my cats I got one for my dogs, I am the only one working in the home. Got my coupon & so did my Mom. Thanks.